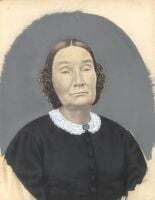 [S8] 1850 United States Federal Census, Ancestry.com, (Provo, UT, USA: The Generations Network, Inc., 2005), Online publication - Ancestry.com. 1850 United States Federal Census [database on-line]. Provo, UT, USA: The Generations Network, Inc., 2005.Original data - United States of America, Bureau of the Census. Seventh Census of the United States, 1850. Washington, D.C.: National Archives and Records Administration, 1850.M432, 1,009 rolls. , Hancock, Illinois, roll M432_109, page 334, image 132. [S9] 1860 United States Federal Census, Ancestry.com, (Provo, UT, USA: The Generations Network, Inc., 2004), Online publication - Ancestry.com. 1860 United States Federal Census [database on-line]. Provo, UT, USA: The Generations Network, Inc., 2004.Original data - United States of America, Bureau of the Census. Eighth Census of the United States, 1860. Washington, D.C.: National Archives and Records Administration, 1860.M653, 1,438 rolls. Bushnell, McDonough, Illinois, post office Bushnell, roll M653_201, page 0, image 139.